Behind the surrealist gesture of Gerard Depardieu — the first Frenchman of world renown to ever take Russian citizenship — there is a good deal more sense (and absurdity) than would appear at first glance. Drawing by Natalya Mikhailenko. Click to enlarge the image. 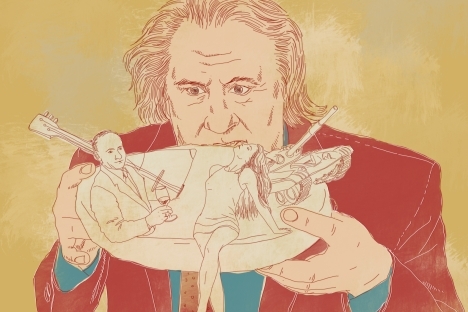 It is impossible to explain French prominent actor Gerard Depardieu's gesture without first dissecting the French soul. The French soul, like its Russian counterpart, is intrinsically polarized, albeit in its own unique way. On the one hand, it is rebellious, revolutionary, and capricious. It is Marianne, the "Triumph of the Republic." On the other hand, the French soul is prone to ambition verging on vanity, spilling over into egocentricity, aloofness, and self-attachment. The Frenchman is ready to defend the most radical democratic principles; at the same time, he will gladly seek the company of kings, princes, oligarchs, Hollywood actresses, and other movers and shakers. His French soul is warmed not by the power of others, but by his own. To top it all off, he is an inborn patriot of a country so luscious, resplendent, and pristine, so like the scented skin of a high-society “belle,” that he becomes enraged when his beloved France behaves herself in an unbecoming manner: kowtowing, for instance, to America; or whenever she deviates from her divine, yet Voltairian predestination. Now, in the eyes of Depardieu, Russians are hobbling towards a brighter future; but Depardieu's gesture itself is linked to the fact that France, too, has picked up a limp. The French people elected a socialist president, whose campaign promise to slap monstrously absurd taxes on the country's rich has driven many abroad. Regardless of whether such taxes would have saved the French economy (very unlikely), the principle here is important. The rich scattered in all directions at the very mention of the new tax. Depardieu was one of those ensnared by the moronic scheme. It was quickly rejected by a French court as unconstitutional, but not before demonstrating that today's France is not what it once was. The son not only of a communist tinsmith but also of the Paris riots of 1968, Depardieu, the star of many acutely anti-bourgeois and sexual films, an icon of "Frenchness" and the bohemian spirit, and a wisecracking clown to boot, also feels that something is amiss. Looking for a way out, he willingly swallowed our Russian bait. The Kremlin, fed up with all the talk about Russia's creative class fleeing abroad to escape the authoritarian and repressive laws, pulled off a propagandist coup. Depardieu also inflicted a terrible blow to the anti-Russian sentiment of French journalism. It had tried so hard to poke fun at Russia's attempts to become a civilized country (it was, in fact, funny on occasion) and had seemingly entrenched itself in the heart of the Frenchman, that renowned hater of tyranny… And then this about-face! Had its arguments lacked conviction all along? In actual fact, one must look at how the French really relate to Russia. In my view, their attitude resembles a four-layer cake. The top layer of the cake is the most noxious. This is the political layer. France, despite a few temporary alliances with Russia, is ready to brand Russia a despotic and imperial threat. The second layer contradicts the first. The French know and love the culture of Russia. That is why Depardieu based his decision on Russian culture, citing the example of Valery Gergiev. The third layer of the cake is the old, eternal Russia: an immortal, mythical simulacrum and begetter of ideas and things; from the luxury of the Kremlin chambers to beef stroganoff; from the Trans-Siberian railway to the balalaika; from caviar to Russian beauties in folk headdress. The “sui generis” nature of Russian culture is held in great esteem in Paris, too. The fourth layer is the warmth of Russian relations and Russian friendship: the toasts, the Karamazov-style conversation, the accessible or inaccessible (depending on who you talk to) women. It is also a positive layer that is available on a personal level, even to French journalists. And there is something else — not a layer, but more of a circus piece. Russia is the anti-France, in a good and bad sense. Everything is upside-down, like in Chagall — which is why its various manifestations, including communism, are so alluring. If one trivializes the first layer, turns it inside-out and grows fond of it (the French like smelly cheese! ), as Depardieu did through the force of his own rhetoric, then the cake turns out to be somewhat unusual, though palatable. A very close eye needs to be kept on Depardieu. Who knows: maybe his presence in Russia will spark a revival; order will be established and happiness will ensue. Kill the fatted calf for this universally loved thespian, scrub the country till it gleams, take it down to the barber's for a shave, plant red roses, organize (to spite all) a civil society, launch rockets into the sky... But if it all falls flat, he will dash away — the scoundrel! The opinion is first published in Russian in the Ogoniok magazine. Viktor Erofeev is a well-known Russian writer.